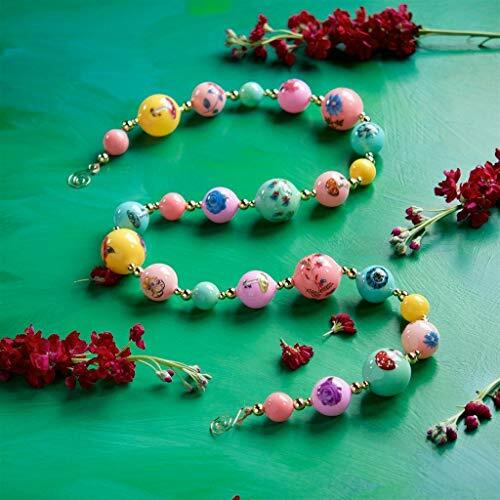 Nathalie Lete Glass Ball Garland CG0188 48″ Long Garland of Glass Ornaments From Glitterville, this set of blown glass ornaments, hand painted with floral and nature designs, strung to 48″ long Garland Nathalie Lété is a wildly popular French artist. She lives and works at her enchanting studio in Paris, which once housed the iron-working factory that forged the Eiffel Tower. Her colorful works are inspired by travel, vintage toys, and antique engravings of flowers and animals. She brings them to life in a colorful, innocent, and quirky poetic style, nurtured by the folk art origins of her Chinese father and German mother. Her popular creations can be seen in countries throughout the world.